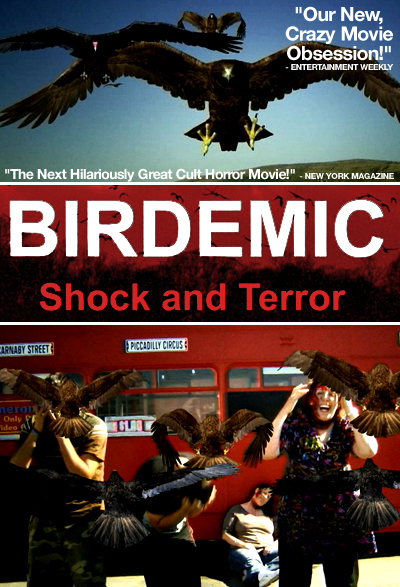 In the realm of bad cinema Birdemic: Shock and Terror is on another plane entirely. 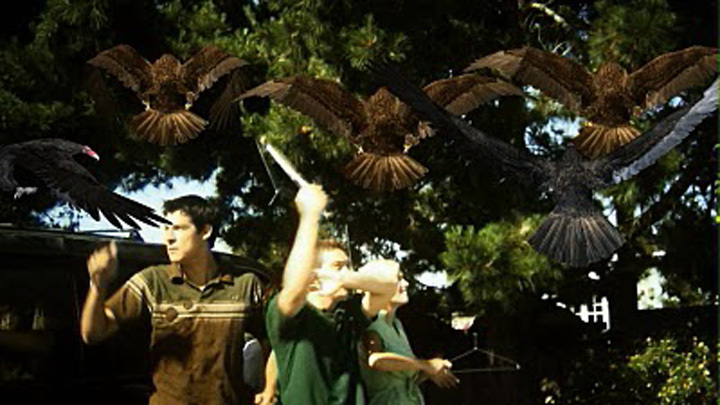 It looks like the movie was intended as a serious effort, but when screenings elicited laughs, groans, and guffaws, the filmaker figured Birdemic‘s pure awfulness might make it a cult flick. Irregular sound, music that has no connection to the action (or to the movie, for that matter. repetitious and generic is understatement), woodenly awkward dialogue, and the indescribable editing are only a few of the myriad pratfalls this video makes. It begins as a burgeoning romance between a software salesman and a model who just got the cover of the Victoria’s Secret catalogue. (a nerd and a lingerie model – already an unbelievable scenario, but ne’er to worry, it gets worse…) This took the entire first half of the movie. No other plot. It is particularly painful due to the awful acting and tortured dialogue. I was surprised that Nathalie (the lingerie model) didn’t have a restraining order on our software tycoon, Rod, by fifteen minutes in. It was really rather creepy. 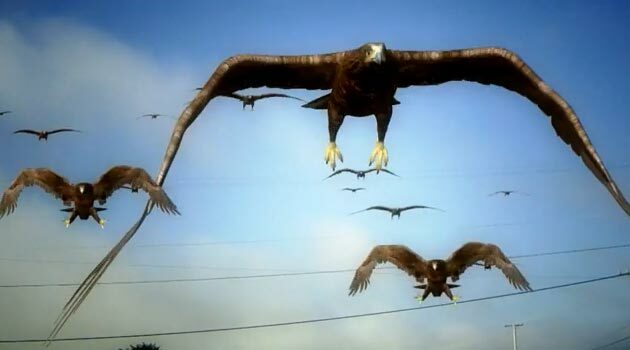 Small flocks of the aforementioned eagles and vultures fly around in curiously regular formations and hover menacingly. Yes, hover. I know what you’re thinking: “sacredcalf, eagles are too heavy and the vultures’ huge wingspan would make it impossible to hover, wouldn’t it?” To which I would reply: Yes, and I don’t think their wings are articulated quite the way shown, either. We won’t mention the perspective issues… I can go on about these digitally un-hanced birdstrocities but let’s just leave it with that. So, back to the movie… We’re halfway in, the weird romance has just been consummated in a motel room, (he just closed a million dollar deal and a cheap motel room is the best he can do?) and the birds (finally) show up, screeching and hovering in formation. 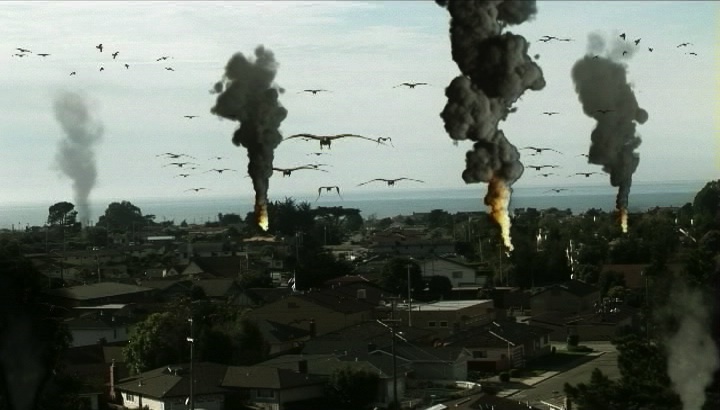 Why they show up isn’t immediately clear (and it really doesn’t ever become clear, at least i couldn’t figure it out) but here they are and they’re crapping acid and dive-bombing and exploding (kamikaze exploding eagles is actually kinda cool) and pecking peoples’ eyes out and messing ladies hair-dos and all sorts of dangerous bird attacking stuff. Sensibly, our newly-glowing couple decide they need to get outta Dodge. Fortunately an Ominously Disgruntled Veteran and his girlfriend who happen to have a van full of weapons are staying at that very same motel! I won’t spoil the ending for you – you will have to see this movie yourself to truly appreciate the perseverance required to make it the entire ninety minutes.